Receive a treasure at each participating business when you explore the beautiful shops and services in UpTown Waterloo. 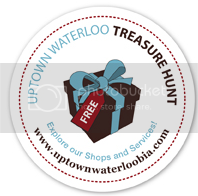 Join the Treasure Hunt through UpTown Waterloo again this year and join the fun. When you finish the hunt, enter for a chance to win a fabulous grand prize basket. The UpTown Waterloo Treasure Hunt is fun for everyone! There is a better way, not only to buy and sell homes and houses buy to shop for special, unique and meaningful gifts for your loved ones. Besides going to the mall, don’t forget to shop at our local uptown and downtown businesses. We think, you’ll be glad you did.